I love the illustrations of Stephen Michael King and I Love You Too is filled with the gorgeous water colour and ink pictures King is well known for. The beautiful text and individuality and confidence of the characters in the story make this picture book one to read, re-read and treasure. The text is sparse, simple and evocative. ‘The world is filled with windy days, should stay inside days, but we explore, fly a kite, swoop, dive ...’ It inspires as much movement as the illustrations. King has captured the four friends in I Love You Too in all sorts of activities as they romp together through the day. These illustrations are playful from the beginning – with stunning gentle dragonfly endpapers - to the end. There is quiet joy on every page. The story celebrates and reinforces the beauty of being with friends you love. 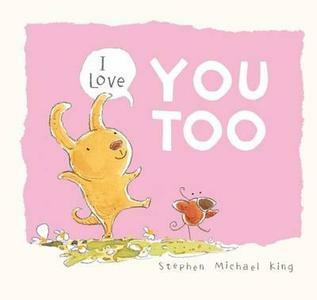 This picture book is a perfect one to share with someone you love. It will entrance, entertain and inspire children from a very young age.